The Big Tube concept is a new 'calculatable' approach. To understand the Universe there no need for mystic explanations, neither the need to believe in a complex system, and it confirms the intuitive 'feeling' of so many people that there is a Unity in this Universe, a vibrating force. But Tunity offered already to many people a remarkable understanding of the Cosmos, and even a better understanding of their religion. Unity offers the possibility to explain in a rather simple and understandable way the complexity of dimensions, and offers a solution for infinitessimally small and the infinitely large gravitational interaction. In fact the old image of the Ouroboros: a snake biting its tail ... is not that bad. First holons have three layers, and we see the same dynamics in biology, where the fertilized cell develops by three layers: the endoderm, mesoderm and ectoderm. Maybe some mathematicians trapped in the uni-dimensional view of the string theory and in some views like the Calabi-Yau space in the Branes theory or the Ekpyrotic universe will find here some teasing alternative aspects. In fact you might say that the two separate wands of the Ekpyrotic universe are our two tube wands (which would add the real key to Burt Ovrut and his team). And also people who like the Holomovement of Bohm and Hiley will find here the undivided and unbroken wholeness. Bohm describes the Implicate Order of the Bohm formulation in terms of Lie Sphere Geometry as describing trajectories "... as a kind of enfolded geometric structure whose meaning can be seen all at once as a 'chain' of successively contacting spheres..
Till today (October 2002) I didn't found an approach in string theory or other system which describes the process of pelastration, 'hollow' cosmic strings being a part of the unbreakable membrane and the possibility of auto-pelastration in tubes. 1052.86: Please now think of all the tensional forces of Universe as one single membrane containing all the radiational, explosive forces we have enumerated. Now think of the original compression sphere exploding into many ... individual, exploded-apart, spherical mass components, each of which is tightly embraced by the membrane__leaving only intervening perpendicular linear tubes. However, I add here the concept of unbrokenness. Where this means that there cannot be an explosion. Then there is no "exploding", but smooth pelastrations (topological penetrations) to create the "many"(multi-layered spaces or topological holons). The universal concept _ that can be symbolized by the universal CROSS (and also an addition) _ I offer is how two parts of a single dynamic membrane (neutral Energy) can couple to make a multi-layered space (a sub-set UNION, that the observers sees or measures as a UNIT). So a part of the unmanifested energy shows itself as a local dynamic topological space. Buckminster Fuller didn't come up with the essential process of pelastration, which implicates that the gravitational outside membrane of our universe is present in the smallest particles ... and also in each atom of our body, but also the 16 billion year old original energy source. We see now (June 5, 2003) a large number of Branifications pdf's files published on arXiv.org database. Maybe our website gave new ideas? The most interesting and important scientific work is - in my opinion - "deformational structures" of Sergey Kokarev, and contains the WAY to prove TUNITY. A basic mathematical presentation is give on the Yin-Yang webpage. Today (July 25, 2003) I put some pdf-files on the web. These show how I expanded the basic idea in Einsteins GR (tensors) to multi-layers. On July 20, 2003 I put an animated image on Superstringtheory.com showing this. The Big Tube is in fact ... a single infinite unity ... . The Big Tube has also religious implications. People who want so ... can find in this concept the proof that God exists and that we are a direct part of Him ... and that the same universal energy plays in all beings and objects. But people with non-deisitic ideas will find here also a different type of universal logic. 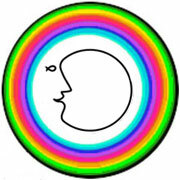 Now it is also interesting: some people mailed me and say: a great logo ... it show the growth idea: an Embryo. That's right. But there is more ... in this image. ;-). A smiling face ... looking to itself? For me personally this Big Tube approach offers me (1) as an inventor the satifaction that I discovered a new type of mechanism, (2) as a philosopher the way to explain and understand a number of 'strange' realities of this cosmos, such as synchronicity (Carl Gustave Jung), homeopathy, acupuncture, clairvoyance, Kabbalah and other fields where resonance is the prime intermediary, (3) as a human the feeling of joy to be connected to all others. Everything is connected to everything, it's only a question of amplitude, length, frequency, level, angle and position in the tube constellation. Thank you for your visit. Stay tuned. Just like the cosmos ... this is a constant changing and growing website.